There is no need to worry about what to do in Dublin during your present holiday; a visit to the Little Museum of Dublin will be a refreshing start. 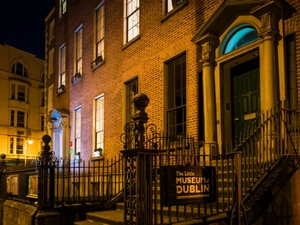 This unique Dublin attraction promises to provide the most exploratory guided tour of an unusual collection of artifacts. This museum fondly called the ‘People’s Museum’ has in its collection lots of treasures of various types. This diverse artistry collections were donated by all the people of Dublin for the entertaining and educative pleasure of the Nation’s citizens and foreigners included. made by individuals. It is running from the three floored Georgian town house that has been in existence since the 18th century. The museum can be easily located at 15, St Stephens Green, Dublin, Ireland. Dublin City Council are the owners of the building that the museum is using. You should take note of an important fact before visiting the next planned event on your schedule of things to do in Dublin. You are set to see the Little Museum, know that the case here is not like the other national museums. It is not allowed here for visitors to wander unattended to, all by themselves on all the floors of this gallery. You are only allowed to do that on the first floor, but would need to be in a company of a guide to help you on a tour all around the other floors of the building. A whole lot of stories about the country and its people couple with illustrations all viewed through a guided tour. So many photo pictures, souvenirs, advertising, and letters that date as far back as from year 1900 to 2000. Over 5000 collection of art works within all its showrooms. While all visits and tours are free, it is important to take note of something special, before heading out to see this great Dublin attraction. The features on the first floor can be viewed alone, but will need to get a guide to take you through the second and third floor. The museum requires that you book for your ticket in advance so that you can have a tour guide available to take you through. These tickets are not free; you can pay for and book one online via their website. This has to be considered and planned for, to avoid a long wait at the venue for a tour. Carefully plan this visit as you are scheduling the things to do in Dublin events. The little Museum of Dublin proudly exhibits over 5,000 pieces of artwork from its awesome and diverse collection. The massive pieces were received after the shout out of Simon O’Connor and Trevor White to the people of Ireland. That call was made in 2011, asking for more donations of artifacts for the gallery, but the turnout was massive. This has caused this Little Museum to be filled with lovely valuables that has become a major attraction in Dublin. It is a famous guided exhibition that presents the most valuables as it regards to the best of Ireland fashion of the past and present. This exhibition is initiated to celebrate the fearlessness of some fashion designers in the 1950s that were brave enough to go against the economic gloom in the nation at that time to create a profitable fashion niche that extended to New York, London and Paris. It is running from January 20th to march 25th this year. this is an exhibition that is set up to honor the home based rock band stars for all the impact made for the past 40 years. The features presented in this exhibition have been curated by fans of this famous rock band just for this exhibition. There are a lot of items on display including bands’ photographs, autographed albums, rare songs and other amazing features and items from this awesome rock band. Fans of this band flood this particular exhibition. This exhibition is an ever running one on the second floor, you will need to plan for great music-based display by booking a ticket online. This exhibition is about the popular politician in Dublin called Alfie Byrne of the 20th century. It reveals the great achievements of this prominent and effective politician to the benefit of those in Dublin. Within his lifetime, he served as the Mayor of Dublin for ten times with a lot of wonderful accomplishments that all the citizens remember so well. This exhibit is in honor to the hard work and marvelous accomplishment of the beloved “Alfred the Great” as he was called by the press.